Located in the northwestern corner of Qinghai Lake, the island, less than 1 square kilometer, is a natural habitat of more than 100,000 migrant birds, including bar-headed geese, ruddy shel-ducks, cormorants, swans, and brown-headed gulls from southern China and the Indian Ocean. May and June are (he best time for admiring the birds. 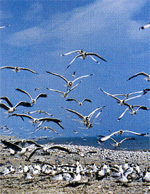 The flying birds blot out the sky and cover the sun, forming a splendid view on the island.